In this article, you'll learn how to connect or disconnect Facebook from your Mailchimp account. To access the features of this integration, you’ll need an active Facebook account that manages at least one Facebook Page. This integration doesn’t add a signup form or post to your personal Facebook profile. Learn more about Facebook Pages. When you set up the integration, you must approve each of Facebook’s permission requests. To change the permissions, first disconnect, then reconnect the integration. To access Instagram images in the content manager or auto-post to your Instagram feed, you’ll need to add Instagram to your Facebook Page and convert it into an Instagram business account. To learn how, check out Add an Instagram Account to Your Facebook Page. If you have trouble with your Facebook connection, check out our guide to troubleshooting the Facebook integration. You can also connect your Facebook account to Mailchimp to create Facebook and Instagram ad campaigns. To learn more, read Create a Facebook or Instagram Ad With Mailchimp. 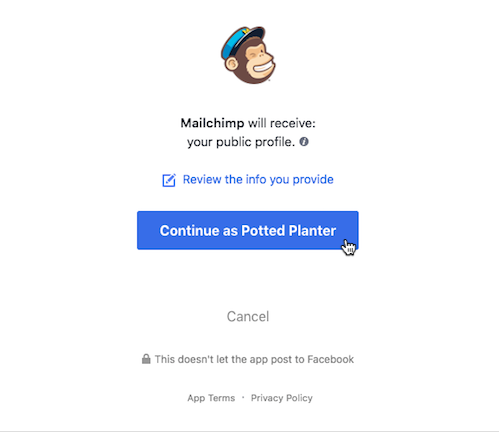 To integrate Facebook with your Mailchimp account, follow these steps. Click Facebook to expand the Facebook integration details, and click Log In. If prompted, input your Facebook credentials and log in. In the profile permissions pop-up modal, click the button to continue. In the Pages permissions modal, click OK to approve Facebook's permissions requests. You must approve each of Facebook’s permission requests to use the integration. After you connect the integration, we'll display a success message in your Mailchimp account. Now that you’ve connected the Facebook integration, you can add a Mailchimp signup form to your Facebook Page, auto-post to your Facebook Page timeline and Instagram feed when you send an email, and access Instagram photos in the Content Manager. To disconnect the Facebook integration, you'll first disconnect it in your Mailchimp account, then remove it from your Facebook account. 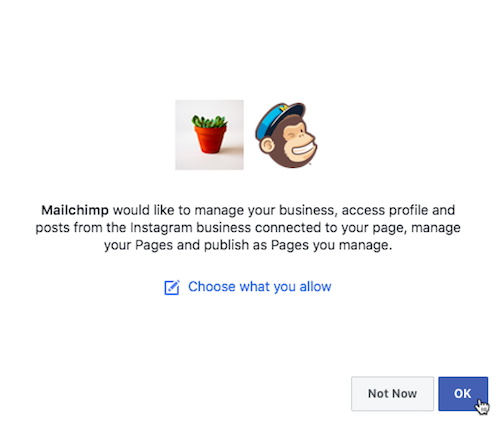 To disconnect Facebook from your Mailchimp account, follow these steps. Click Facebook to open the integration settings. Click Disconnect to remove the application from Mailchimp. After you've disconnected the integration in Mailchimp, you'll need to disconnect it in your Facebook account. 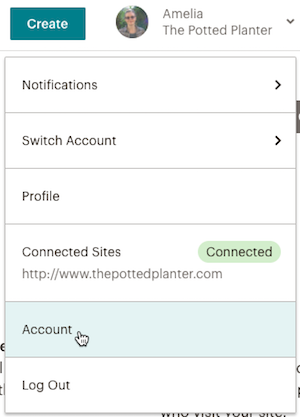 You can reconnect Facebook with your Mailchimp account at any time. 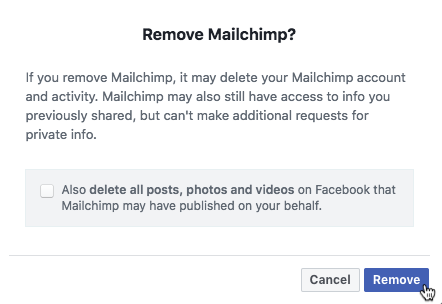 To remove Mailchimp from your Facebook account, follow these steps. Click the drop-down menu in the upper-right corner of the screen, and choose Settings. In the left navigation panel, click Business Integrations. Check the box for Mailchimp. In the pop-up modal, click Remove to confirm that you want to remove Mailchimp from your Facebook account. Check the box if you also want to delete everything Mailchimp has added to Facebook on your behalf. Add Mailchimp email signup forms to your Facebook Pages. Learn how to customize your forms and fix common issues. With Mailchimp's Facebook integration, you can automatically post your campaigns to your Facebook Page with each send.